The year 2015 began as any other year... I mean the hangover situation in particle physics. We have a theory of fundamental interactions - the Standard Model - that we know is certainly not the final theory because it cannot account for dark matter, matter-antimatter asymmetry, and cosmic inflation. At the same time, the Standard Model perfectly describes any experiment we have performed here on Earth (up to a few outliers that can be explained as statistical fluctuations). This is puzzling, because some these experiments are in principle sensitive to very heavy particles, sometimes well beyond the reach of the LHC or any future colliders. Theorists cannot offer much help at this point. Until recently, naturalness was the guiding principle in constructing new theories, but few have retained confidence in it. No other serious paradigm has appeared to replace naturalness. In short, we know for sure there is new physics beyond the Standard Model, but have absolutely no clue what it is and how big energy is needed to access it. Yet 2015 is different because it is the year when LHC restarts at 13 TeV energy. We should expect high-energy collisions some time in summer, and around 10 inverse femtobarns of data by the end of the year. This is the last significant energy jump most of us may experience before retirement, therefore this year is going to be absolutely crucial for the future of particle physics. If, by next Christmas, we don't hear any whispers of anomalies in LHC data, we will have to brace for tough times ahead. With no energy increase in sight, slow experimental progress, and no theoretical hints for a better theory, particle physics as we know it will be in deep merde. You may protest this is too pessimistic. In principle, new physics may show up at the LHC anytime between this fall and the year 2030 when 3 inverse attobarns of data will have been accumulated. So the hope will not die completely anytime soon. However, the subjective probability of making a discovery will decrease exponentially as time goes on, as you can see in the attached plot. Without a discovery, the mood will soon plummet, resembling something of the late Tevatron, rather than the thrill of pushing the energy frontier that we're experiencing now. But for now, anything may yet happen. Cross your fingers. The neutrino masses and leptonic mixings are not really part of the standard model, and maybe there will be more surprises in this sector. Also naturalness principle maybe taking a hit for the Higgs mass or gauge Hierarchy problem, but it is still a reliable guide where there is no multiverse/anthropic explanation, such as for the smallness of the strong CP phase. Can you explain your plot? What exactly is plotted? The probability of discovering new physics in that year? How exactly did you calculate that? Perhaps the plot is a joke I didn't understand?! 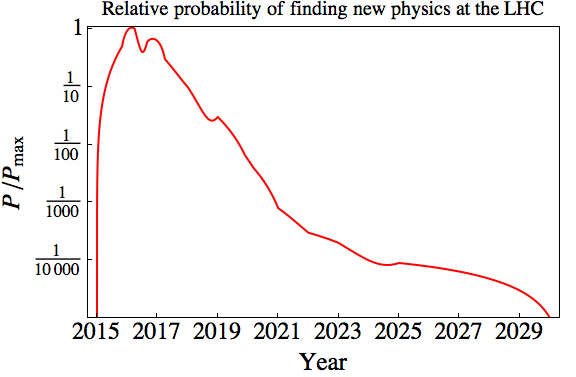 The plot shows the probability of finding new physics at the LHC per unit of time, normalized to the maximum probability that occurs in early 2016. It's not entirely a joke. It is based on the LHC schedule, Madgraph simulations, and Nostradamus' prophecies. i dunno about naturalness - personally i suspect that it makes more sense to look at octonion algebra. It does seem to like Maxwell and thus generalizations of Maxwell like Yang Mills. It would be funny if dark matter comes in three generations with anti-dark matter, but not really fermions - but having color. Or maybe not. I think you mean Onion algebra. Onion algebra is a parody of complex algebra. If we insist on the assumptions of absolute scale and strict reductionism, and they are only inadequately tested assumptions, we may be dooming ourselves to continued doldrums and evermore bizarre pseudophysics. Anon, SHiP is a cool experiment (one of several experiments of this kind planned in near future). However, just like at the LHC, there is no guarantee nor any hint they will find something new. Of course, this paper is not mainstream (serious?) physics, even though the logic seems correct in itself. The precision of the results is still incredible. The laymen confusion that something has to be discovered or particle physics is in a deep merde is simply not true, for many reasons! I think what Chester means is not that this is the end of particle physics as an intellectual endeavor, but the end of the possibility of raising enough money to pursue it on a serious scale. that is a very real perspective - and fear for people who have their life or at least career attached to it. there are numerous anomalies, many in indirect observables, mainly in flavour (last week a few of us counted more than 10). Various relevant analyses of the 2012 data set are not yet out or just emerging - in flavour, but also in high-pT searches. So with an April 2015 startup, I think you should allow at least till 2016 or 2017 for anything more subtle than a dimuon resonance in the new dataset. Gell-Mann and Levy invented Cabibbo mixing based on a 3-sigma anomaly (in a footnote). It took 10 years to postulate the charm quark as a direct consequence and 14 years till a naturalness argument was used to correctly predict the charm mass (barely anticipating the J/psi discovery). Perhaps simply no-one has puzzled the current anomalies together yet into the correct model. Even if someone did today, it might take a decade until it's verified (not necessarily, though possibly, involving the LHC). The real point with naturalness, I think, is that there ARE known natural theories of the weak scale. Even if they are slightly beyond the LHC reach, they're massively preferred over, say, the SM. Now it seems that the big "good" natural ideas (SUSY, compositeness) seem to have been had already, and this is frustrating for theorists. "we know is certainly not the final theory because it cannot account for dark matter, matter-antimatter asymmetry, and cosmic inflation"
In the case of dark matter and cosmic inflation, the data increasingly point to these being gravitational phenomena that aren't going to be solved by the Standard Model ever. In the case of matter-antimatter asymmetry, the increasingly unavoidable conclusion is that it was present at t=0 and that the "natural" hypothesis of B=0, L=0 at the moment of the Big Bang is wrong, suggesting that t=0 may not have been t=0 after all. There is every reason to believe that all that is left to add to the Standard Model is an explanation of where its constants come from, a solidification of neutrino physics, and adjustment of the beta functions to reflect quantum gravity. I am in the camp predicting no BSM physics at the Standard Model. The most important finding we will see in the second run of the LHC is that it increase the minimum scale at which any modification to the running of the gauge coupling constants can be present, with it, forcing up the scale at which SUSY can be excluded. "If, by next Christmas, we don't hear any whispers of anomalies in LHC data..."
On the other hand, please think twice about making statements like the one above ^^~ As an LHC deserter I assure you there'll be blood spilt during this summer in a battle to present results on new physics prematurely, unnecessarily relying on too few data against all reason and common sense, and against all worldwide work regulations and international treaties. This post is a good example to illustrate that most of what's wrong with particle physics is the attitude. And you really should know better. I have no idea why all this doom and gloom, just a couple of years after the discovery of the first ever fundamental scalar field with nonzero vev?? Somehow the imagined "golden age" of the 50-ies in particle physics is lamented by people born way,way after discovery of the Standard Model. I could make a 1000 different arguments why particle physics at that time was depressing. There was absolutely no rigorous proof or "no loose" theorems why increasing energy was the right thing then, and it looked like absence of a small parameter will not allow us to calculate anything related to strong force. The fact that there *is* a fundamental scalar is in my mind akin to the existence of the atomic nucleus - something that does not make sense in the SM. HL LHC will give data to measure the heck out of it. This is a *good* thing! Could it be that the young theorists are just too much of a wooses and are intimidated by hard problems? Is it much easier to write parametrized Monte Carlos and teach experimentalists how to do analyses then actually do fundamental theory? So please do not whine that we are in the dead end just because you do not see the way out of it. Can you say a word or two about how the plot is made? You clearly need to assume some prior over where new physics might occur. If I put a huge prior at 10 TeV gluinos then it would have one shape, and if I put it a huge prior on 200 GeV electroweakinos it would have another shape etc. The methodology is explained in detail in comment #4. The physical interpretation is clear too: the 1st peak is a low-hanging fruit, the 2nd acoustic peak is some less trivial physics that requires more data to isolate. After that it's an exponential fall-off, up to a few glitches that may well be monte carlo flukes. That's not a description of how you made the plot, it's like a caption of what the axes are. You have to have a prior over new physics scenarios to make this plot. What is the prior, that's my question. Once you specify that, then it is a meaningful and easily interpretable plot.